Challenge: To capture rich natural gas reserves in Wyoming, BP had to create a living and working environment in a very remote location. This project had to be completed quickly, under extremely harsh working conditions. Solution: Find a company that could design and build a complete operations center while coordinating and accommodating the needs of numerous departments and levels of management. BP chose Panel Built to get the job done. Panel Built Delivers: From concept to finish, (right down to the flagpoles) Panel Built engineered a 17,000 sq. ft. operations center, complete with break room, conference rooms, office space and emergency living quarters. Panel Built also built a 2,500 sq. ft. warehouse with truck bays. 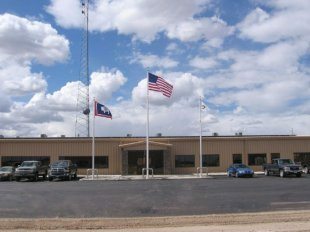 Project Specs: 90’ x 185’ metal building with multiple HVAC zones and completely finished interior. 25’ x 100’ warehouse.